With an increasing population of elderly as a result of the Baby Boom generation, statistics show that elder abuse is more prevalent than ever. According to the Administration on Aging every year an estimated 2.1 million older Americans are victims of elder abuse, neglect, or exploitation. And that’s only part of the picture: Experts believe that for every case of elder abuse or neglect reported, as many as five cases go unreported. One study recognized that for every case of elder abuse reported to agencies nearly 25 go unreported! You might be surprised to know that most abusers are not professional caregivers. 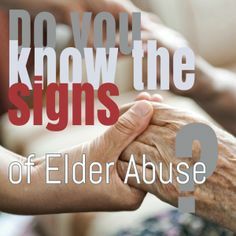 Most elder abusers are family members of the abused. Elder abuse will happen, but everyone can act to protect seniors. Abuse of an elderly person take many forms. Elder abuse takes many forms, be aggressive or non-responsive in nature, but can be distilled down to three main categories: physical, mental or financial. If you observe any blatant signs of abuse — name-calling, threats, intimate contact, unreasonable restraints, withholding of food or medication, etc. — you should take immediate steps to stop it. Elder abuse, however, is rarely that obvious. Many of the conditions and events listed below may be caused by occurrences unrelated to abuse, but then again maybe your relative is being abused. Use this basic elder abuse checklist to quantify possible signs. If you notice the following occurrences or conditions, it is important to carefully monitor your relative’s care or alert the authorities. To report suspected abuse, contact your local adult protective services agency. For state reporting numbers, call the Eldercare Locator at 1-800-677-1116. 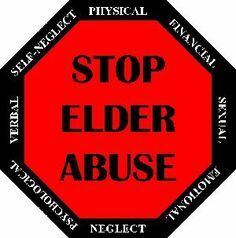 Be mindful that an accusation or even suggestion of elder abuse is a very serious thing, and should not be undertaken lightly or carelessly. Please protect seniors and join us in taking a stand against elder abuse this year! Visit SRAction.org and commit to do something extra this year to raise awareness in your community about elder abuse, neglect, and exploitation! This entry was posted in Advocacy, Caregiving, Certified Caregiving, Elder Abuse and Neglect, Elder Care, Professional Eldercare, Questions 4 Dr. CC and tagged 11 warning signs of abuse, caregiver education, elder abuse, elder advocacy, elder care advice, elder neglect, holisitc eldercare, holistic caregiving, rules affecting aging services providers, senior care at home, Sweet Relief, warning sign of elder abuse. Bookmark the permalink.